On Tuesday, November 12th, the Regional Commission approved the Draft 2016 Regional Plan Schedule and Work-plan. To view the document, click on the link below. 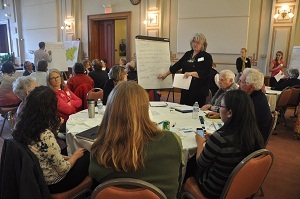 The Regional Plan Draft Review Committee held their first meeting on Thursday, December 19th to begin developing a working Vision and Guiding Principles for Plan Central Vermont. To view a PDF of the presentation from this meeting, click on the link below. 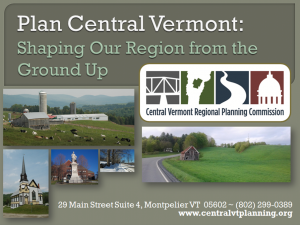 On Tuesday, September 24th, 2013 the Central Vermont Regional Planning Commission (CVRPC) held a kick-off meeting at the Vermont College of Fine Arts in Montpelier to begin the planning process for a regional plan update. The 2016 Regional Plan, Plan Central Vermont, will take up a variety of issues between 2013 and 2016 to build a more resilient and engaged region. 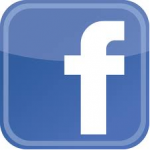 To view photos from the event, please visit and like our facebook page. The purpose of this meeting was to share the types of analyses and input CVRPC anticipates coordinating as part of the process, and to identify partner organizations that may wish to participate in and help guide Central Vermont to a more sustainable future—by serving on either the Regional Plan Draft Committee or a topic specific working group. 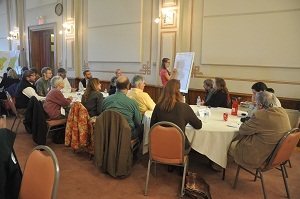 65 people were present at the meeting, representing over 60 organizations and municipalities. For a link to the presentation slide from the meeting click here. After the presentation, five breakout groups were formed to further discuss regional plan considerations by topic area and determine three priorities. For a link to the notes from each topic area, click on the topics below or click here to view notes from all of the breakout groups. CVRPC envisions this collaborative approach to planning will help form new partnerships and strengthen local and regional organizations. CVRPC anticipates engaging a broad and diverse population in the development of a long term vision for Central Vermont and in the identification of goals and priorities for each topic area for implementation. Your participation in the process will provide valuable input to ensure that a variety of traditional and non-traditional methods are utilized to share and gather information for all populations. The end result will be an engaged, more sustainable Central Vermont region with a plan that continues to put economic and natural resource health on the same footing as transportation and land use. Coordinating efforts for this initiative will begin late Fall 2013. CVRPC serves twenty-three communities throughout Washington County and parts Orange County.